This is one of those books whose author is as controversial as its subject. Gajendra Haldea has overseen the Indian infrastructure landscape over the last two decades as the government's principal policy wonk. India appears to have got worldclass infrastructure policy, but not world-class infrastructure, making one wonder if there is any correlation - or rather, causation - between the two. Here one begs to differ with Haldea's striking conclusion that the "outcomes of flawed policy are usually predictable with a fair degree of precision". The question that needs to be asked is: given that the outcome on the ground in terms of creation of infrastructure assets is not very spectacular in quantity or quality - with some honourable exceptions such as the Hyderabad Airport, the Jaipur-Kishangarh Expressway and the ultra mega power plants - are the infrastructural shortcomings we see the result of flawed policies? Likewise the seminal and extraordinary New Electricity Act, which Haldea authored in large part and which brought in the laudable policy objective of open access. In practice, thanks to an opaque open access charge calculation by the states, it becomes impossible for it to work. Again the question arises whether this flawed outcome was predictable and, if so, why was open access charge calculation not foreseen as an impediment? How much of the burden of the failed open access should be laid at the door of the flawed policy itself? The book has been long in the making and much awaited in infrastructure circles, but I for one was disappointed. I was expecting a magnum opus like Ra.One, distilling Haldea's unquestionably vast and rich experience and sharp understanding of the domain. What one has got instead is more like the film Raavan, a letdown, for the book is only a collection of his old articles, with two new chapters and a postscript for each article. For someone who wants a bird's-eye view of infrastructure in India, it is an excellent resource, but for someone seeking the magnum opus, it does not go as deep as I believe Haldea is capable of. In the hallowed halls of the Indian Administrative Service, Haldea is one officer who has both intense admirers and equally intense critics, but no one says he is working with a hidden agenda like many others. He is a person who reads every scrap of paper of every file in front of him. So given his immense and rich knowledge, many expected an infrastructure treatise. In that sense it is a lost opportunity. 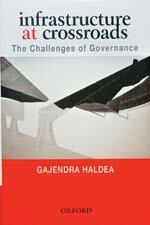 The articles in the book cover most infrastructure sub-sectors but with a focus on power and roads. The Planning Commission's view of infrastructure development is that most ministries, following varying, non-uniform documents and practices, did not have a correct appreciation of the complex issues behind developing infrastructure projects, nor the capacity to implement them. As such, many a time, the ministries ended up being captive to contractors and other vested interests that held them in thrall for years. There was, the Commission felt, a real need for some government institutions to step in and create one uniform framework for developing infrastructure in India and the Planning Commission has assumed this role under the new government. Thus, while in theory Haldea's Model-Concession Agreement filled a vacuum and was considered to be world-class in many respects, there were several problems in its implementation. More often than not, the ministries simply disowned responsibility since the document was not theirs, and saw it as a 'mandatory' agreement and not as a 'model' one. Private developers faced prolonged frustration in working with the document, given, what they regarded as its frequently onerous requirements and inflexibility.